Whether it be a Retaining Wall, Patio Pavers, a courtyard with lights, or a bar and outdoor kitchen, A&N Lawn Service can help to bring the indoors out with our design team and Outdoor Living ideas. As landscape design experts, we’ll listen to your needs and desires to create a stunning landscape design that will transform your yard and be sure to impress. 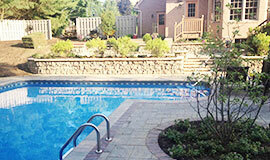 Your landscaping is the introduction to your home, so let’s make your guests welcome. As a full service lawn and landscaping company, we offer extensive residential and customized commercial lawn service and maintenance packages. 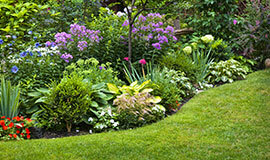 These can include anything from weekly maintenance to mulching and weed prevention. With more than 30 inches of snowfall each year in Pittsburgh, it’s important to plan for prompt snow removal service. 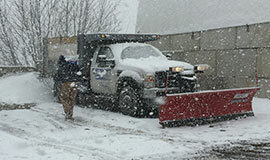 We provide professional commercial snow removal, plowing and salting services in the greater Pittsburgh area. Pittsburgh, Allegheny County, Butler County, and Western PA.
A & N Lawn Service can make your yard and outdoor property look great. Since 1996, we’ve offered landscaping, lawn, and hardscaping services to Pittsburgh, Allegheny County, Butler County, and surrounding communities. Whether you’d like to spruce up your existing landscaping or create a whole new look, our experienced team will work with you to develop landscape design/installation projects. During the winter, it’s important for many companies to have clear roads, sidewalks, parking lots, driveways, and loading docks. That’s why we offer professional snow plowing and removal services to Allegheny County businesses. We love to work with home and business owners during the entire process–from ideas to design to implementation! Your priorities and desires are our primary focus in the design process. We’ll combine our creative skills with technical knowledge to create the outdoor living area, landscaping, or lawn that you’ll want to enjoy every day! Your property will look amazing and the value will increase.